Most of us have lashes that either point downward or straight out, which can make the eyes look tired. 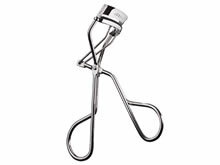 A lash curler will curl your lashes in an upward direction and give your eyes a youthful, awakened appearance. Make sure to always use the lash curler on clean lashes to avoid breakage or pulling the lashes out. After the lashes are curled you can apply mascara, which will help to set the curl.